The craft (or art?) of becoming Presidential was invented Philadelphia. But who actually set the tone in the first President’s House? That would be Philadelphia’s most prominent enslaved African, George and Martha’s Hercules. One of nine enslaved Africans owned by George and Martha Washington, Hercules headed up the kitchen at the Presidential Mansion at 6th and Market – located, ironically, steps from today’s Liberty Bell Center. Because of his immense talent at the culinary arts and his skills in managing eight assistants, Hercules was allowed to sell the leftovers from the Washingtons’ table and earned enough to augment his wardrobe. Hercules cut quite a figure on the red-brick sidewalks. Hercules was important, but he was not free. And although Pennsylvania’s Act for the Gradual Abolition of Slavery assured he could become free, he remained enslaved. As the law’s six month deadline approached, the Washingtons’ worked the loophole by taking their slaves out of state before the deadline passed. This earned everyone another six months of legalized servitude – even in the City of Brotherly Love. So, for all the feasts Hercules pulled out of the fire, no doubt the greatest was his own first taste of freedom. In March 1797, on the eve of the Washington’s departure for Mount Vernon, Hercules departed his basement kitchen for the last time. This time, Hercules was a free man. More than 210 years later, we’re slowly learning a thing or two about Hercules. Today, days before Washington’s birthday, the Kitchen Sisters included his story in a feature on National Public Radio. On February 28, 1967 The U.S. Third Circuit Court of Appeals, in a 3-2 decision, reversed a September 2, 1966 ruling by U.S. District Court Judge Joseph S. Lord, 3d, that Girard College must admit African American pupils under the Pennsylvania Public Accommodations Act. The first African American students were admitted in 1968. On February 28, 1969 the historic Benjamin Rush House, built before 1700, was demolished by mistake by a city wrecking crew of the department of licenses and inspections. On February 28, 1973 an earthquake rocked greater Philadelphia at 3:20 AM, lasting for 6 seconds. It shook buildings and awakened thousands of alarmed residents. No damages or injuries were reported. The quake was felt from Trenton to Baltimore, with its epicenter under the Delaware River at Chester. We hear the museum at Valley Forge is on again. Now the campaign goal is $150 million – up from $100 million since we first learned of the proposal in 2002. The increase is due to the sensible addition of an endowment, as well as land acquisition costs. This last change may also be a needed breakthrough for the project. The American Revolution Center is no longer planned for federal land. Rather, the sleek design by architect Robert A. M. Stern will make its way from the parking lot at Valley Forge to a nearby tract currently owned by the Archdiocese of Philadelphia. The project stalled out in June 2004 when, on the eve of a planned $10 million gift by the Oneida Indians, the National Park Service suddenly forced the nonprofit American Revolution Center to stop raising money. The Oneidas, who were looking forward to an elaborate and solemn ceremony recalling their gift of 600 bushels of corn to Washington’s starving troops at Valley Forge, had no choice but to take their check back to Upstate New York where they wrote the trip off in embarrassment and disappointment. Many institutions take a step forward and a step (or two) back. Whatever it may be, the American Revolution Center’s ability to raise $150 million from sources around the nation – widely acknowledged as essential for the project’s success – is still very much an open question. Once again, it is “do or die” at Valley Forge. Do the leaders at Valley Forge have what it takes to convince the Oneida Indians to return for a third time in a quarter of a millennium? A few days ago, the American Institute of Architects published a list of “America’s Favorite Architecture.” The Philadelphia buildings on the list may be America’s favorites, but are they Philadelphia’s? Can we even take seriously a list on which five, a slim percentage of the total 150, are homegrown? No local edifice cracks the top 20, although Philadelphia’s City Hall comes in at 21 (between the Brooklyn Bridge and the Bellagio Hotel and Casino). Sixteen of the top 20 (and 25 of the top 50) are in New York City or Washington, D.C. Good thing the editors offer a chance for readers to chime in with what is missing. And with such a short list, plenty is. After City Hall, there’s the Philadelphia Museum of Art (#24); Wanamaker’s Department Store (#32); the Frank Furness’ Fisher Fine Arts Library at the University of Pennsylvania (#54) and 30th Street Station pulling up the rear (#137). If you want the straight and narrow, which the list seems most of the time, what about Independence Hall? Or Carpenter’s Hall? What about the PSFS Building? And how about Richards’ Medical Building? Or Venturi’s Mother’s House? Or other of our buildings (Eastern State Penitentiary, Mercer Museum in Doylestown) that cast significant light, as well as meaningful shadow? 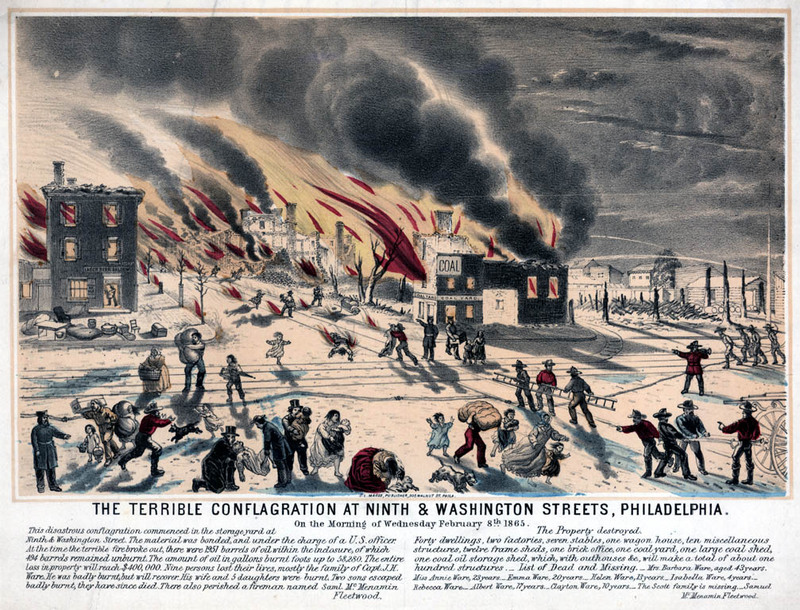 142 years ago: Disaster struck on the morning of February 8, 1865, at 9th Street and Washington Avenue. Fire at a coal-oil yard in what is now the heart of Philadelphia’s Italian Market spread, fuelled by 1,500 barrels in storage. Ice dams turned adjacent snow-packed yards and streets into a sea of fire that killed nine people and destroyed nearly 150 structures, including 50 homes. Capt. J. H. Ware suffered near fatal burns and lost his entire family. Casualties included his wife Barbara, 43, and their seven children: Annie, 23, Emma, 20, Albert, 17, Helen, 13, Clayton, 10, Isabella, 4, and infant Rebecca. One firefighter, Samuel McMenamin Fleetwood, also died in the conflagration. Lithographer J.L. Magee soon published the lithograph, reproduced here, a copy of which is in collection of the Library Company of Philadelphia. 1870 – Mass meeting of Philadelphia’s African American community to plan a celebration of the adoption of the Fifteenth Amendment to the U.S. Constitution, guaranteeing the right to vote. 1874 – Autopsy conducted on Chang and Eng Bunker, Siamese twins, at the College Of Physicians. More from the Mutter Museum. 1935 – Ferryboat Cape May rammed and sunk by freighter London Corporation: 14 hurt. 1950 – Philadelphia Housing Authority selects sites in Germantown, South Philadelphia, Northeast and North Philadelphia beginning $200 million in low-income housing projects. 1969 – The Saturday Evening Post, founded in 1728, ceases publication. 1972 – The Martin Luther King High School at Stenton Avenue and Haines Street, opens with 1,800 ninth graders. 1973 – The Penn Central Railroad system shuts down at 12:01AM as part of a national strike over an attempt to eliminate 6,000 brakemen and conductors’ jobs. Service was resumed the following day after President Richard M. Nixon intervened. 2007 – The Pennsylvania Academy of the Fine Arts sells a whole Eakins, The Cello Player, to help pay for its half of The Gross Clinic. The 1896 portrait of Philadelphia musician Ruldoph Hennig, acquired directly from the artist, had been a gallery highlight at the Academy for the last 110 years. 1973 – Bandits cut phone cables in front of the Tredyffrin Township Police Station, setting off all the burglar alarms in the police communications center while a nearby bank branch is held up for $58,000. 1971 – Samson L. Freedman is the first teacher to be murdered by a pupil. The ceramics teacher at Leeds Junior High School in West Oak Lane was shot to death by Kevin Simmons, 14, as he left the school building. 1945 – Wartime fears of possible bombings lead to a city-wide “brownout.” All electric signs and store window lights are extinguished. 1939 – A coroner’s inquest discloses first inklings of a massive arsenic insurance scam, to become known as the Philadelphia Poison Ring, a murder-for-hire gang responsible for 70 deaths. 1918 – To keep hospitals heated, officials commandeer 125 tons of coal. 1870 – Police crack down on small-time casinos, seizing tables and paraphernalia in the city’s illegal gambling establishments. Yes, scrapple is more than a culinary cul-de-sac. It’s a down-home metaphor that will never, ever, be known as Philadelphia Pate. Scrapple’s pure to this place, and visa-versa. It’s the real thing, the honest thing. No Philadelphia food is older and none so distinctive, in a haggis kind of way. Someone once claimed that the Scottish haggis tastes like bagpipes sound. Does scrapple taste like the Mummers sound? We’re not sure what scrapple sounds like, although we are sure we’ll never hear the end of it. We don’t doubt the story. We do wonder about its migration over the years, and what it really means. 1918:The Book of Philadelphia. Author Robert Shackleton denies the royal origin of the story and attributes it to an unidentified visiting Englishman. 1963: Nathaniel Burt (son of Struthers) presents the anecdote in his book Perennial Philadelphians: The Anatomy of An American Aristocracy. 2003: In a New York Times food story entitled A Taste of Philadelphia: In Hoagieland, They Accept No Substitutes, the late R.W. Apple harkened back to the Burt version. And then there’s our 2007 reprise. So when did the food took on this role as urban metaphor? We’d have to trace that moment back 99 years, when William M. Bunn, Philadelphia clubman, raconteur and semi-professional after dinner speaker made scrapple the theme of a speech at the Majestic Hotel, up Broad Street at Girard Avenue. It certainly does. In his book, Nathaniel Burt helps us understand how. “The Biddles serve the function, peculiar to the Philadelphia psychology, of being a lightning rod.” They descended from a Quaker shoemaker, who “suffered for conscience sake in England jails.” Somewhere along the way, the Biddles took a turn and became “Philadelphia’s First Family for public consumption,” a role, apparently, worthy of derision all around. “When a Biddle gets drunk he thinks he’s a Cadwalader,” wrote Bennett Cerf. Most of us duck that humor. A few wink. So, what, exactly, was Charles’ point? Good thing we stick to our scrapple, here in Scrappletown. Next generation of radio stars!